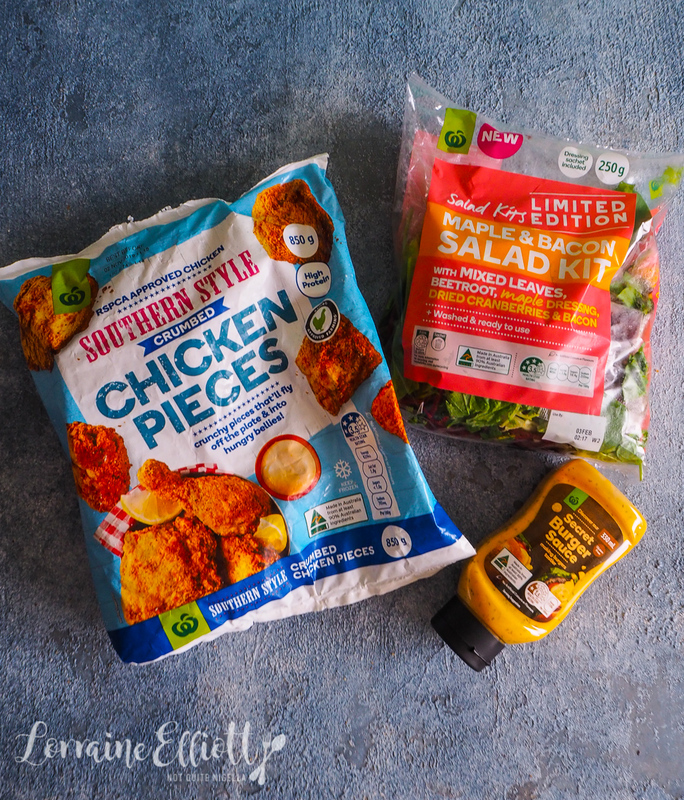 8 Amazingly Easy Summer Recipe Ideas With 10 Minutes Prep! 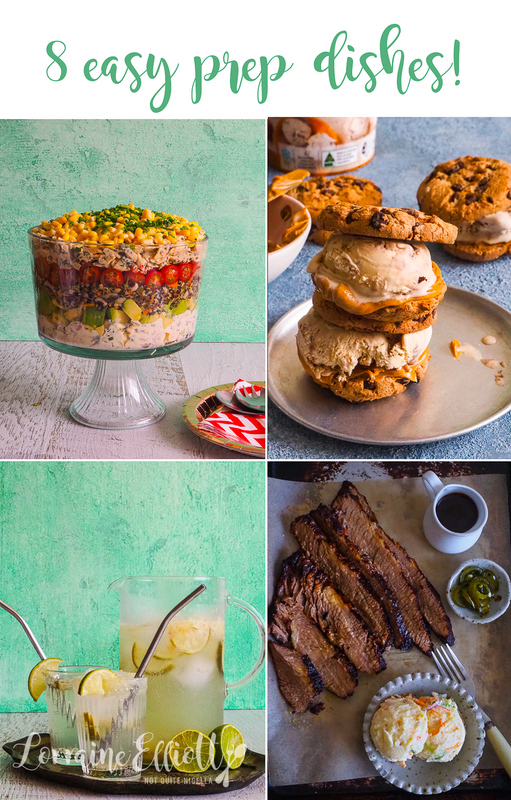 These recipes are brought to you by Woolworths. Want to make the most of summer? These 8 easy recipe ideas will have you enjoying your time outside the house but still eating well. 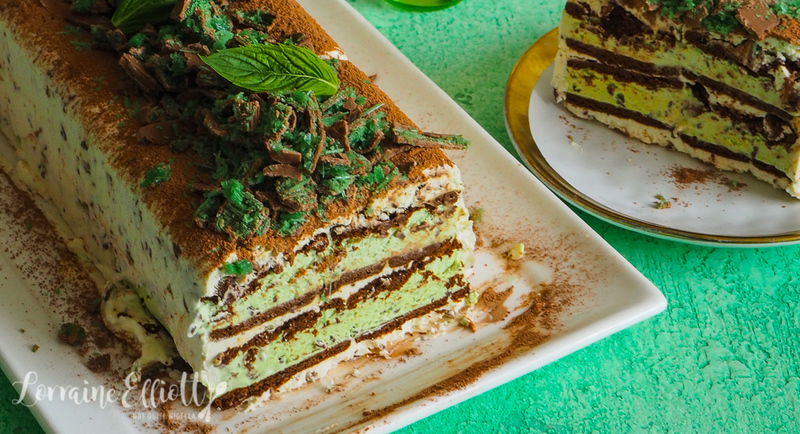 Think a crowd pleasing 6 layer salad; refreshing Limeade; polenta & parmesan fries with pesto aioli; my favourite ever chicken salad (and I mean it, pinky swear); Nashville Hot Chicken with maple and waffles and to finish a quick freeze Chocolate Peppermint Ice Cream Cake! 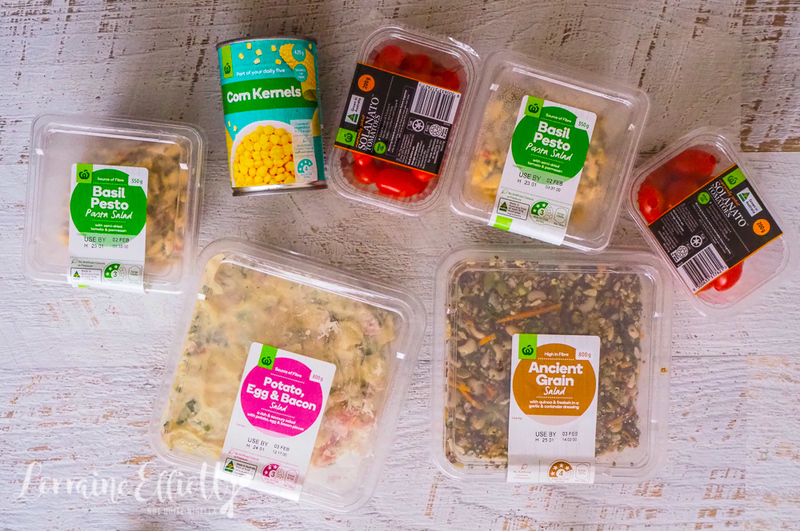 Best of all these take between 5-15 minutes prep thanks to some smart shopping! 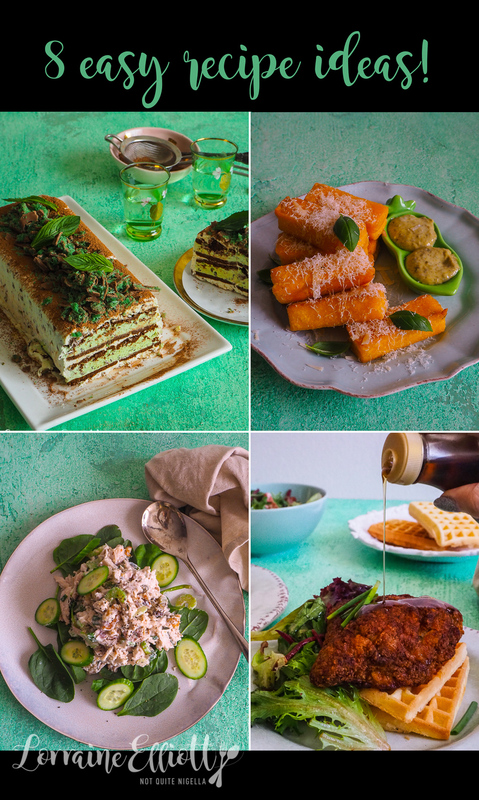 For me, while I love to cook, you may have noticed that my summer recipes are simpler. That's because I don't want to spend too long in the kitchen. I'd rather be out with friends. Winter is another matter where I braise and roast for hours and stay indoors reading or watching movies while waiting for summer to reappear. But summer is really an outdoor season. 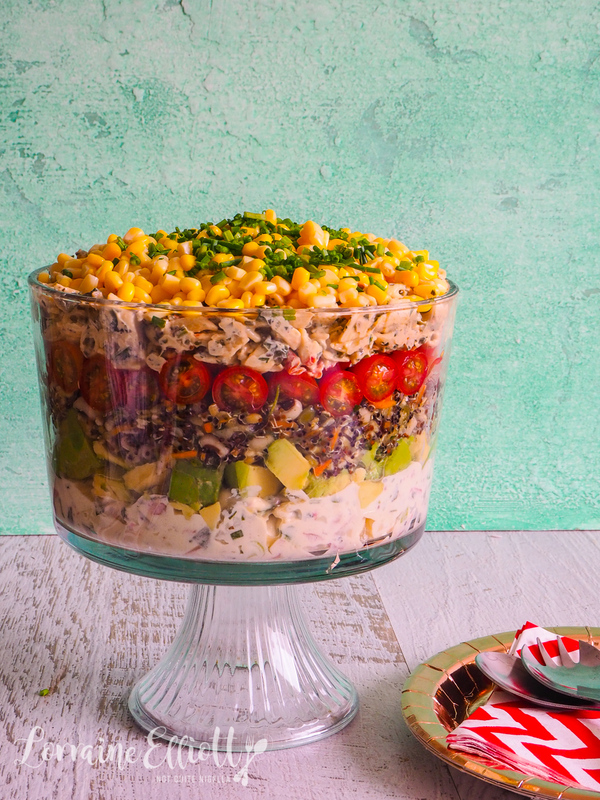 6 layer salad to feed a party! 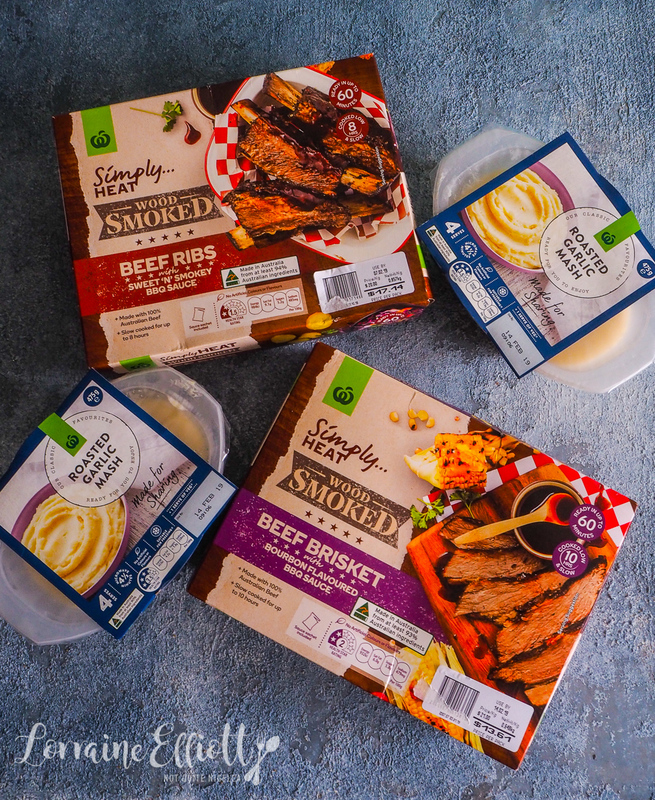 That’s why I’ve come up with some quick and easy Summer recipe ideas using Woolworths’ ready made products. Because sometimes you want to cook something that takes 10 minutes prep but you know me, I like to fiddle with things. And you shouldn't have to sacrifice flavour or taste in order to save time. And here I show that you can use ready made items to come up with canny shortcuts to make a yummy dish! If I could do one thing it would be to be able to control time. Because I feel like I'm in a constant battle to do things while fighting time. By the time the end of the day rolls around I really wonder where the time went. The other night I was up late-much later than I wanted to be. You know those times where you just wish you were home in bed? I was out at dinner and I was bone tired and they had cleared out dessert plates. And sometimes when I am tired I get sort of tired tipsy. I'm not actually tipsy but I feel like it. I get sort of delirious. We were all eager to leave but one guy had gone to the bathroom and been gone for so long we had almost forgotten about him. And I think I almost dozed off and when I woke up I was thinking, "What are we waiting for???" Except I blurted it out loud. Like very loud. I only realised that I had actually spoken out loud when everyone turned to me. I honestly try and be polite most times but when I get tired, things fly out of my mouth. "Did I say that out loud?" I whispered to my seat mate. She nodded laughing. Thankfully our host didn't take offence as I think he too was wondering where he had gone and he too wanted to be home in bed too. So tell me Dear Reader, do you ever blurt out things? Do you get a bit delirious when you are tired? And do you ever wish you could control time? I made a youtube video too! This is one of my favourite salads and a real crowd pleaser if you're taking it to a picnic or a gathering. 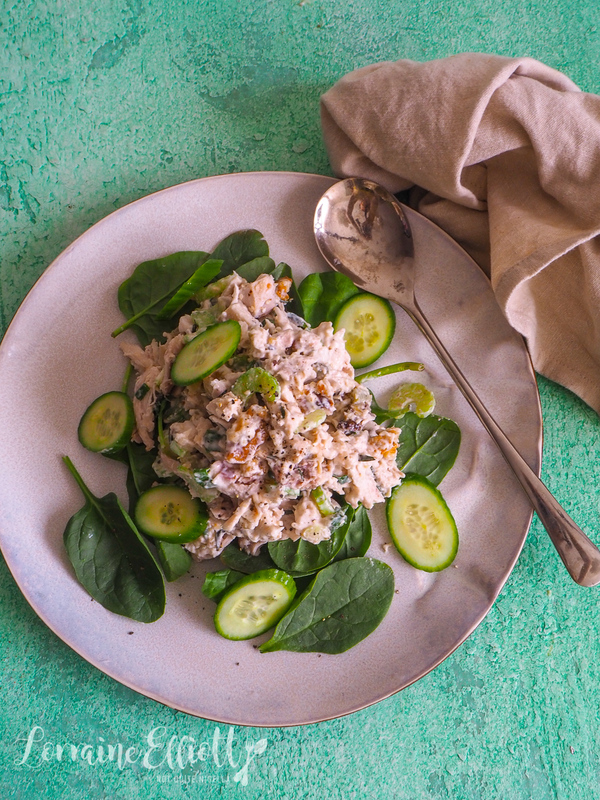 Even though I'm not a huge celery fan, it earns its place in this salad by adding a fantastic crunch along with the walnuts. Step 1 - Remove the meat from the chicken-you should get around 3.5-4 cups of chicken meat. Mix this along with the rest of the ingredients together in a large bowl. Serve with greens or on its own. 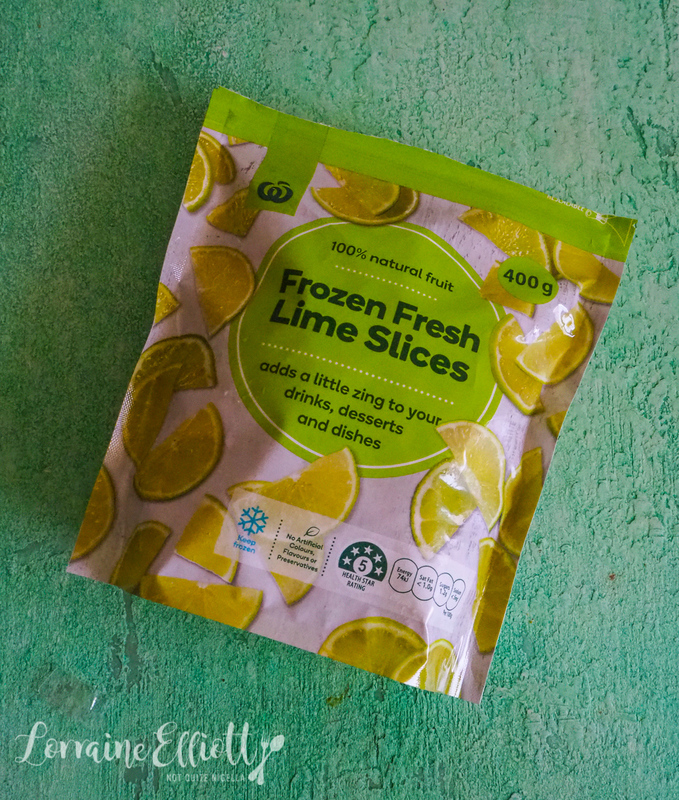 If you've ever baulked at the cost of limes but love citrus drinks like limeade these frozen lime slices are perfect to keep in your freezer. They come already sliced up so all you do is muddle them in a light sugar syrup. 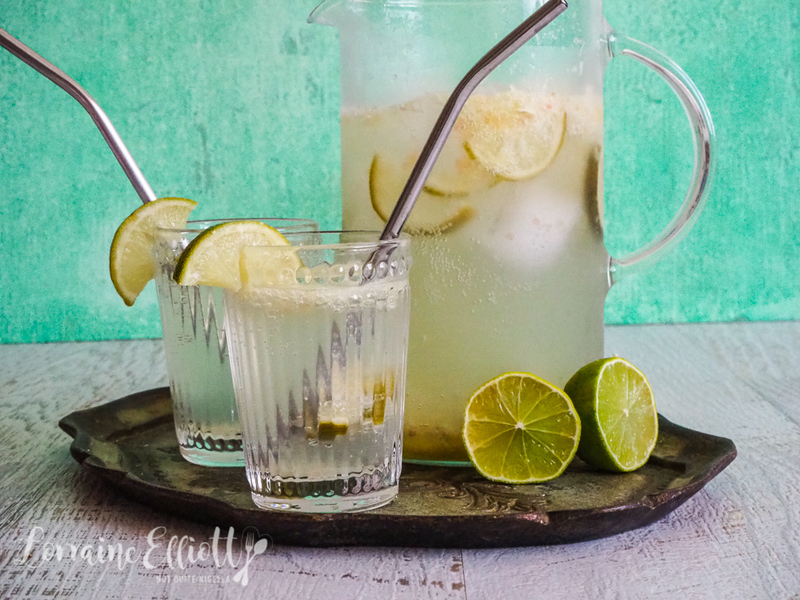 This is utterly refreshing and perfect for a hot day! Step 1 - Boil the water with the sugar until the sugar has dissolved. 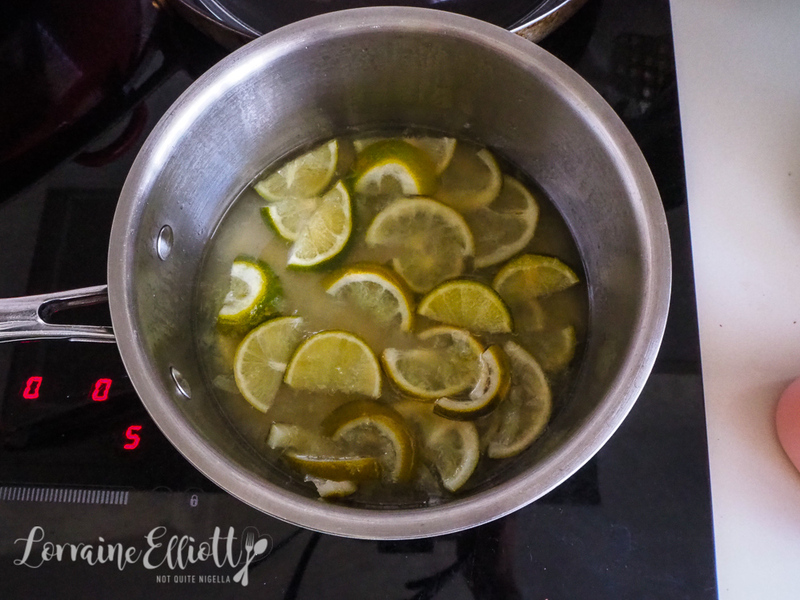 Add the lime slices and cook for 3-4 minutes. 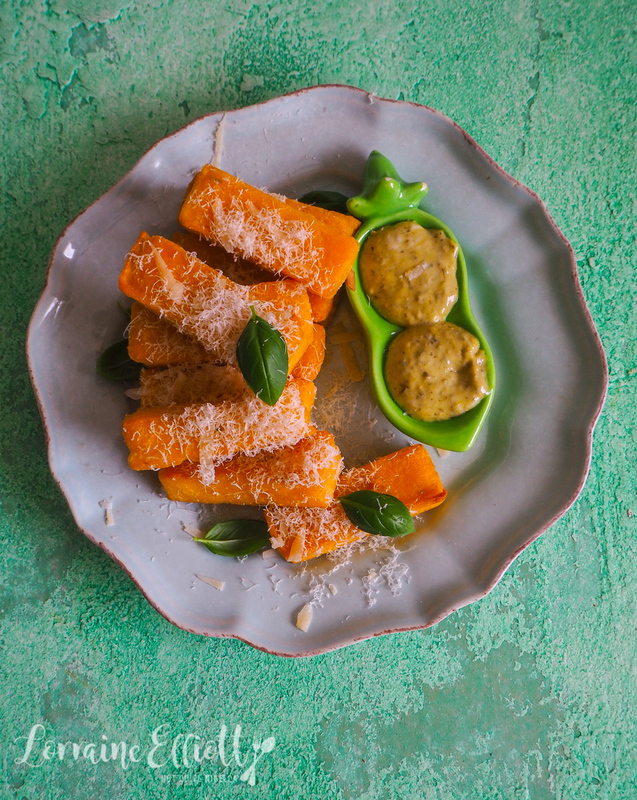 Remove from heat and muddle using a French rolling pin or end of a thick wooden spoon. Allow to cool completely. 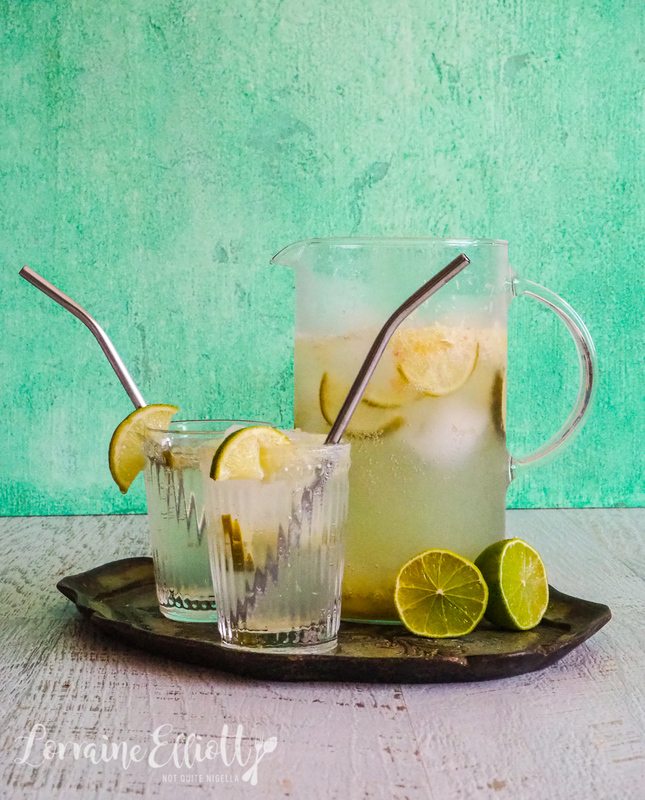 Step 2 - Pour into a large 1 litre jug along with finger lime caviar and top up with soda water. 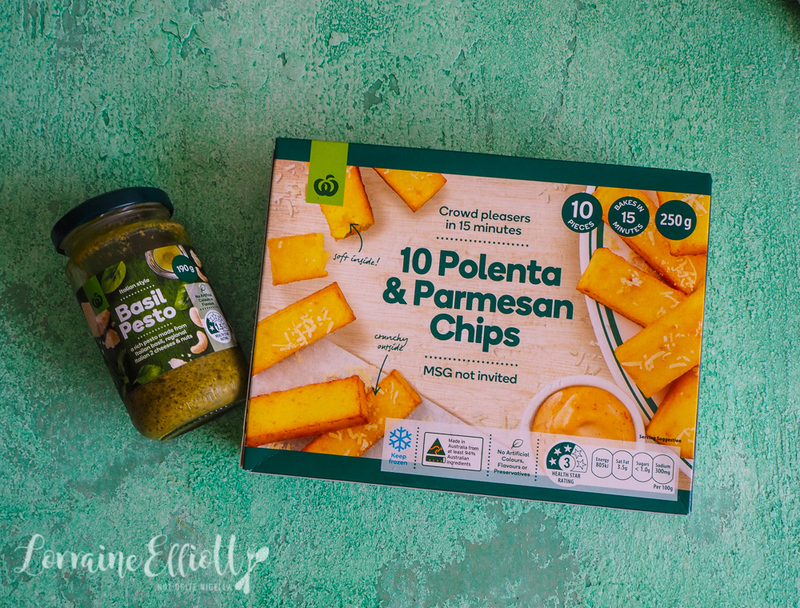 Like a lower fat version of hot chips, these polenta and parmesan chips are just like at your favourite restaurant. Baked rather than fried they are crispy on the outside and soft on the inside. I'd even suggest making double for a crowd they're that good. Step 1 - Preheat oven to 200C/400F and line a baking tray with parchment. 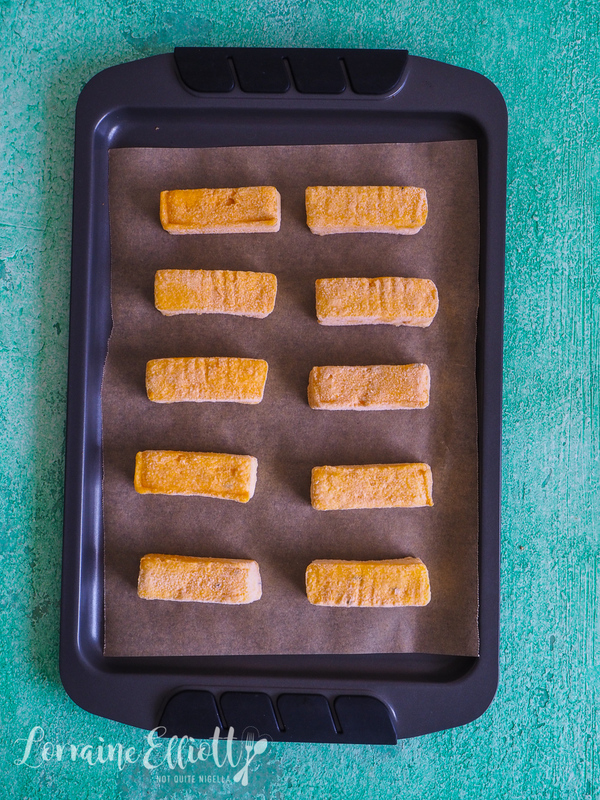 Place chips in a single layer and bake for 15 minutes or until crispy. Step 2 - Meanwhile mix the pesto and aioli and place in a small side dish. 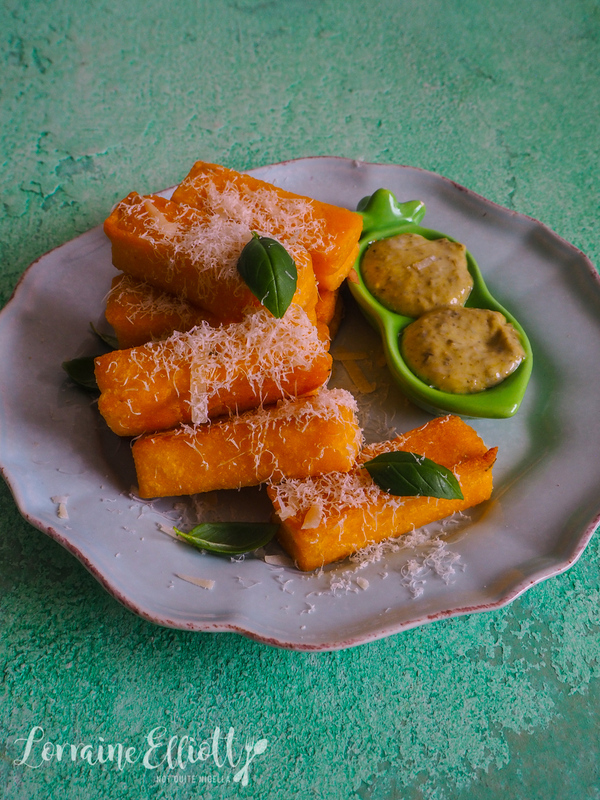 Grate parmesan cheese on top, add basil leaves and serve with the pesto aioli. 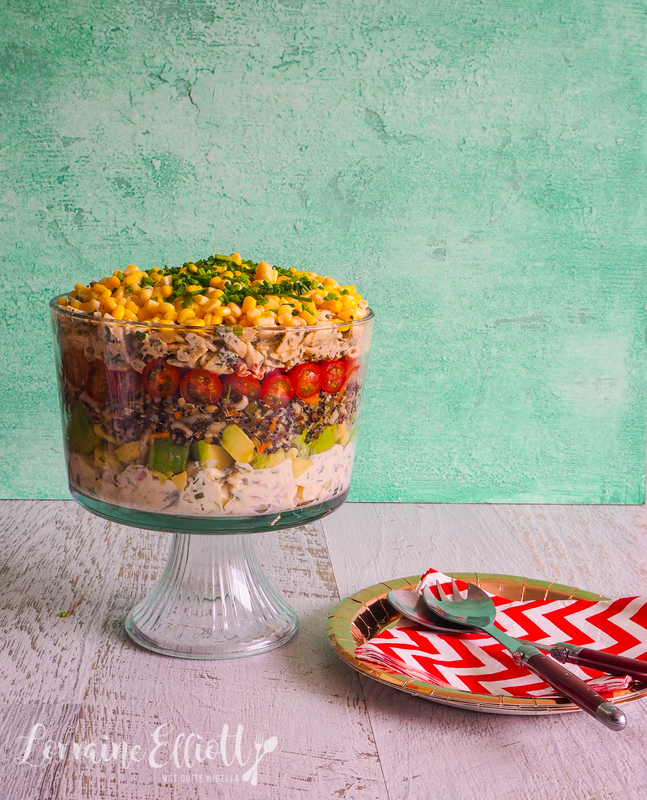 The perfect entertaining salad, this six layer salad melds fresh vegetables and potato, quinoa and bean and pasta salads. This is a real time saver and can feed up to a dozen people as part of a spread. Step 1 - Take a trifle bowl and layer the bottom with potato, egg and bacon salad. Add the diced avocado. Then layer with ancient grain salad pressing down gently to create a smooth surface. Step 2 - Then add the tomatoes-I put a layer of the halved tomatoes cut side facing out and then placed the quartered tomatoes in the centre. Add the basil pesto pasta salad on top of this. Then add the corn on top and then sprinkle with chives. Now Nashville hot chicken is an entirely different beast than chicken and waffles. 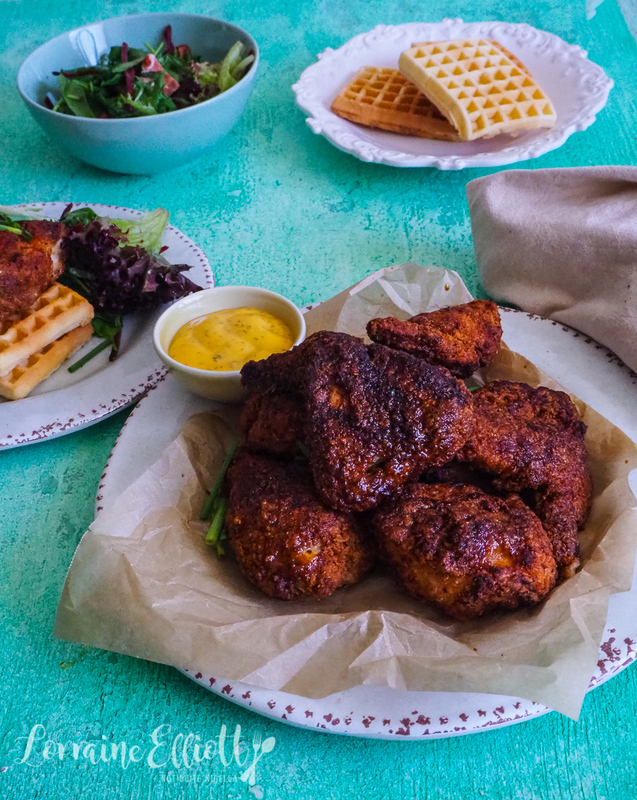 Usually Nashville hot chicken is served with a piece of white supermarket bread and not with maple syrup and waffles. 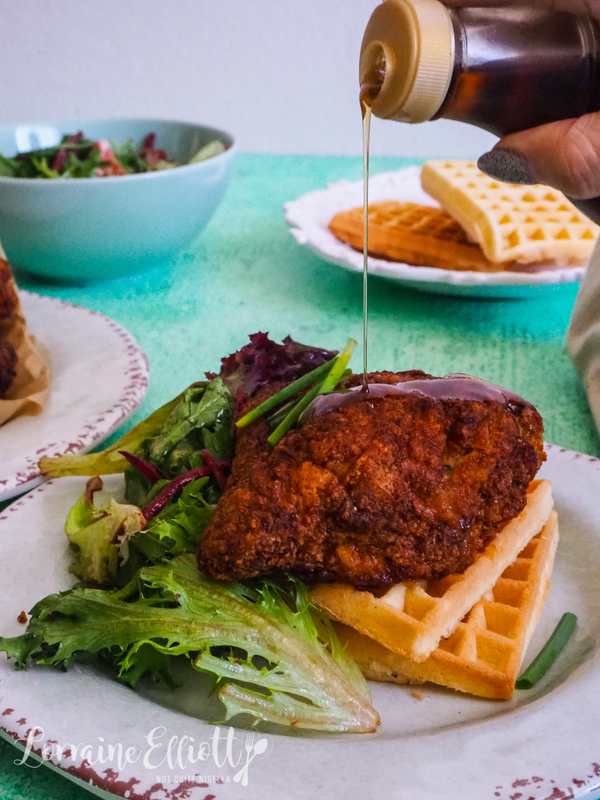 But hear me out Dear Reader, sweet goes so well with spicy (think sweet chilli sauce) and while this was delicious without the maple, once I drizzled maple syrup on the chicken it became one of those things that I could not stop eating! Step 1 - Preheat oven to 200C/400F and line a baking tray with parchment. 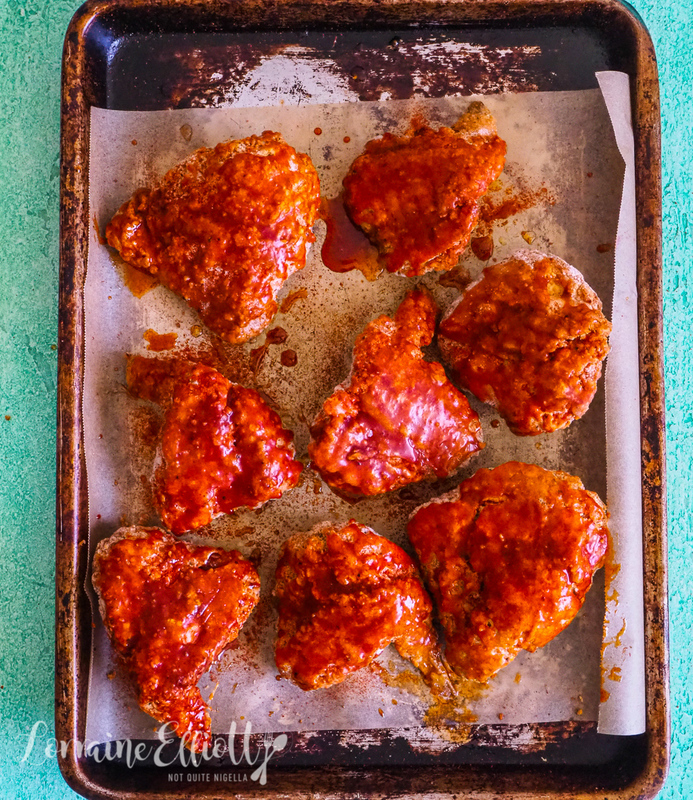 Lay out chicken pieces in a single layer and sprinkle with hot paprika. Combine oil and cayenne pepper and brush it over the pieces. Bake for 40-45 minutes or until done. Step 2 - Make the salad by adding the cranberries and bacon bits and then add dressing and toss. Just before serving toast the waffles and add the salad and chicken. Serve with maple syrup (it may sound odd but trust me, it's delicious!). This recipe saves so much time but the end result doesn't show it (honestly you have to try this!). 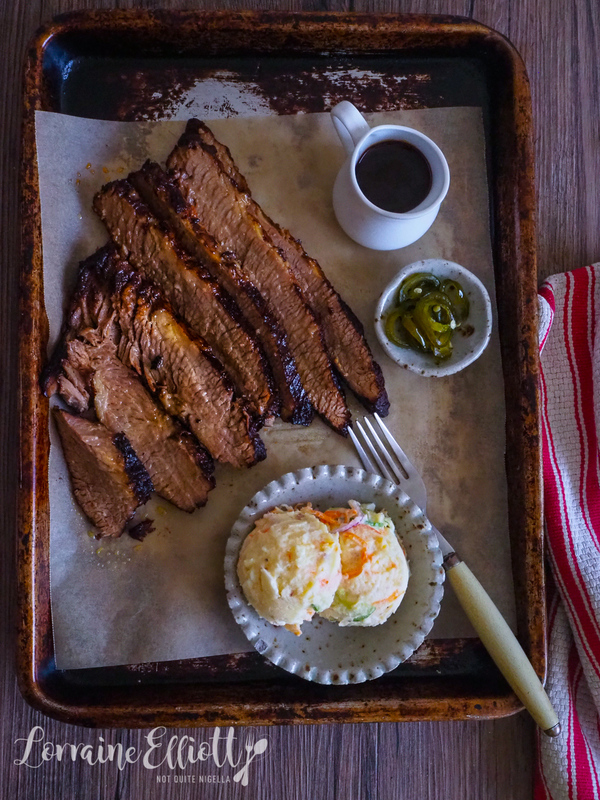 Beef brisket is a big deal. It takes ages to make and you need a smoker as well. 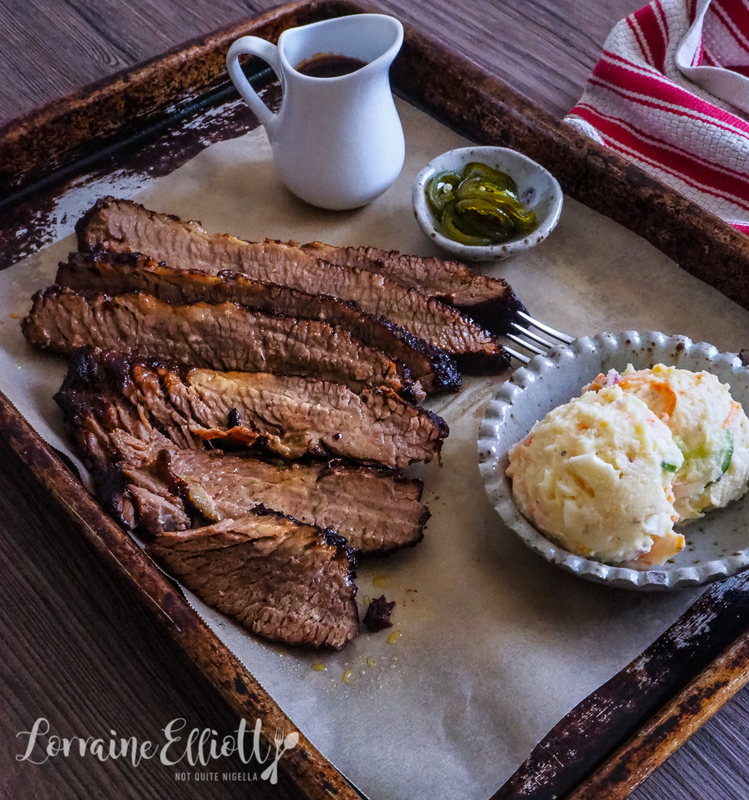 This beef brisket is super soft and tender and tastes like it came from Texas. All you have to do is heat it up in the oven for 30 minutes. For the true Texas experience, eat it with your hands, unadorned without sauce. Japanese potato salad is definitely not on the menu at a bbq restaurant but hear me out. 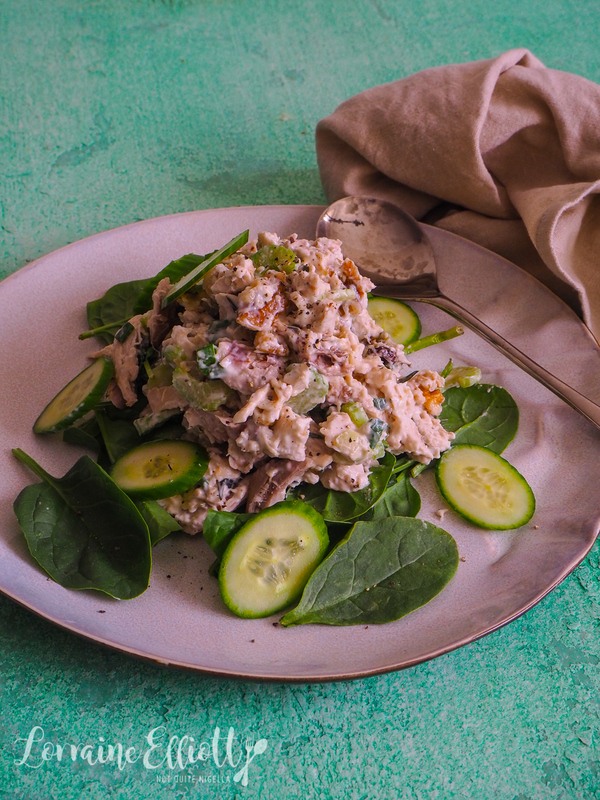 Most of us have probably tried potato salad but have you ever tried a Japanese potato salad? It's amazing! A Japanese potato salad is mostly made up of soft mashed potato with boiled eggs, mayonnaise, onion, carrot and cucumber. It too can be quite a production but I found a fun use for the Woolworths roasted garlic mash. All I had to do was add the mix ins and condiments and I had a divine Japanese potato salad to go with my beef brisket! Step 1 - Heat BBQ with the lid on to medium heat. 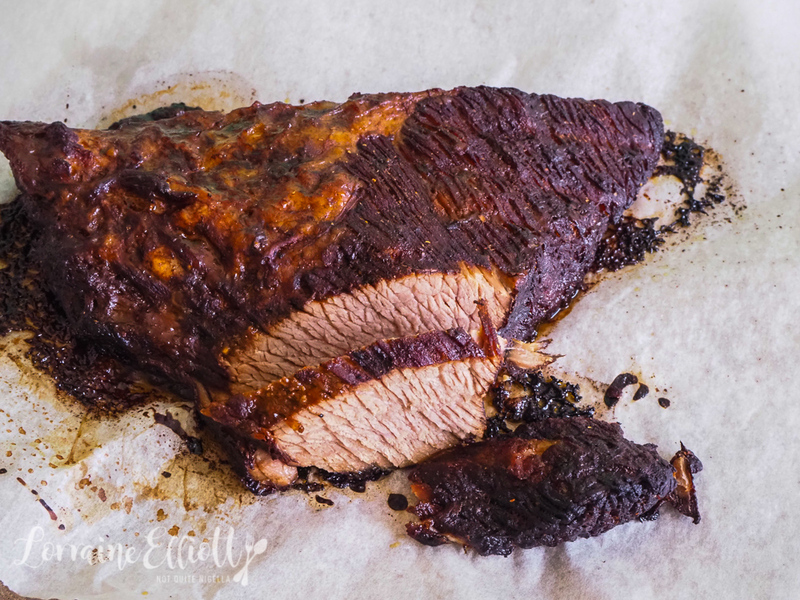 Cook the brisket for 30 minutes per 500g of meat. OR cover with oiled foil and roast in a 210C oven for 25 minutes per 500g. Remove foil and cook for 5 minutes. Rest for 10 minutes then slice. Step 2 - Make the potato salad while the meat is cooking. I find it easiest to have all the ingredients measured out and then you just mix it all up together (don't heat the mash). Season with salt and pepper. 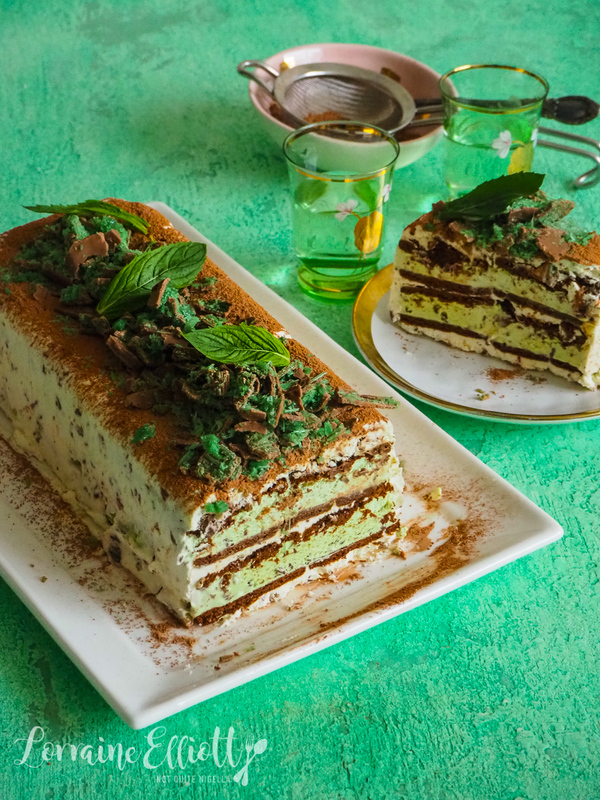 Ice Cream cakes usually require freezing for a few hours or overnight to set the entire thing. This one sets in an hour as it uses ice cream sandwiches wedged with some peppermint chocolate cream so freezing time is a lot shorter! The decoration is a cinch too! Step 1 - Line a long loaf tin on the base and sides with parchment. 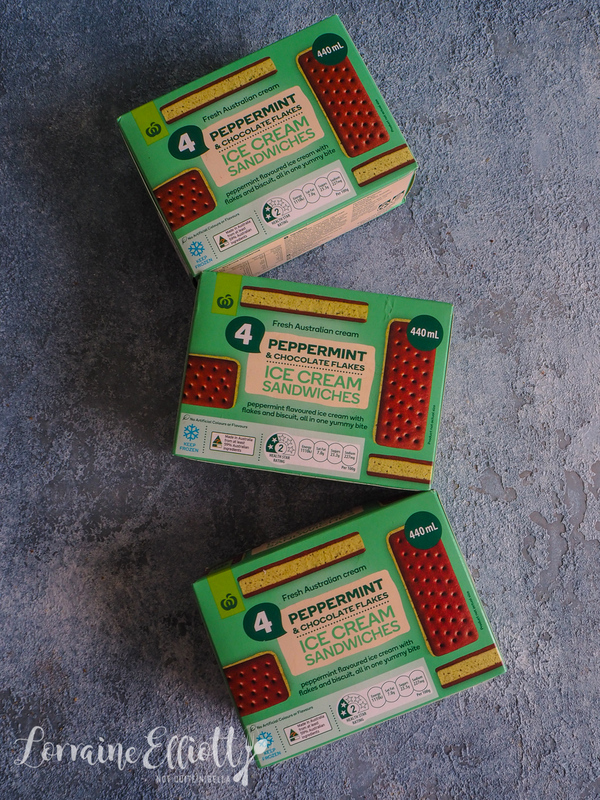 Smash up 2 of the peppermint crisp bars and set aside. Whip the cream with honey or sugar until soft peaks form and then mix in the smashed chocolate bars. Step 2 - Spread some on the base and sides of the lined tin. 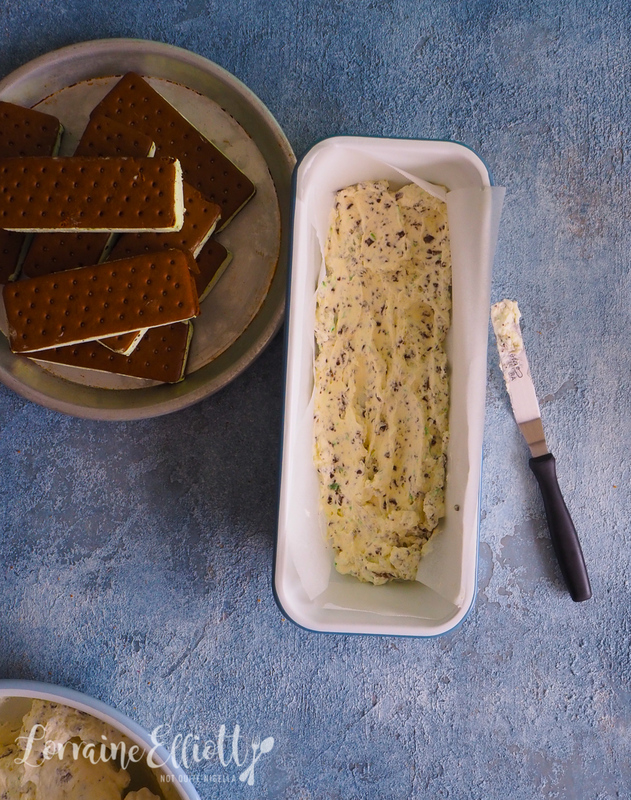 Line with the ice cream sandwiches and the smooth some more cream to fill in the gaps and make another layer of ice cream sandwiches. Cover with some more of the peppermint cream and cover and freeze. It should be set in about an hour or so since the inside is made up of frozen ice cream sandwiches. Step 3 - Dust with cocoa powder and then the remaining smashed peppermint bars. 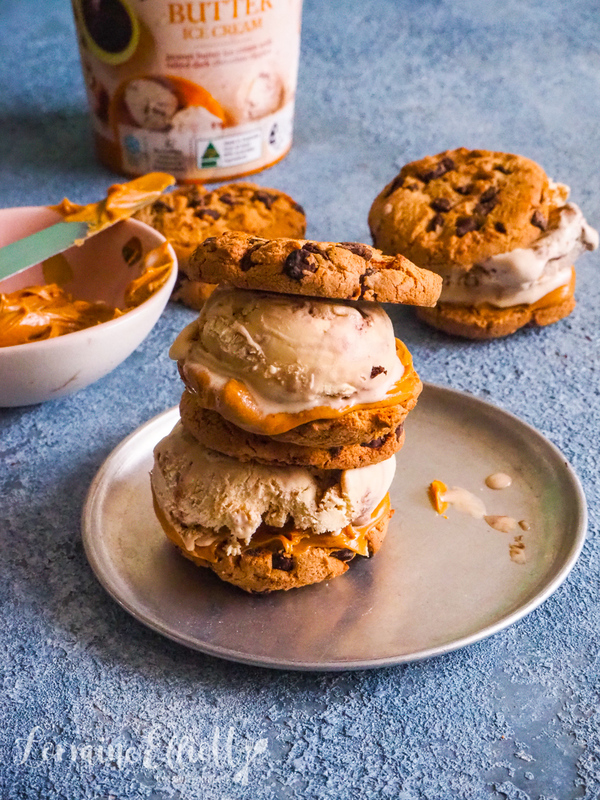 These peanut butter salted chocolate chip ice cream sandwiches are the ultimate easy dessert. 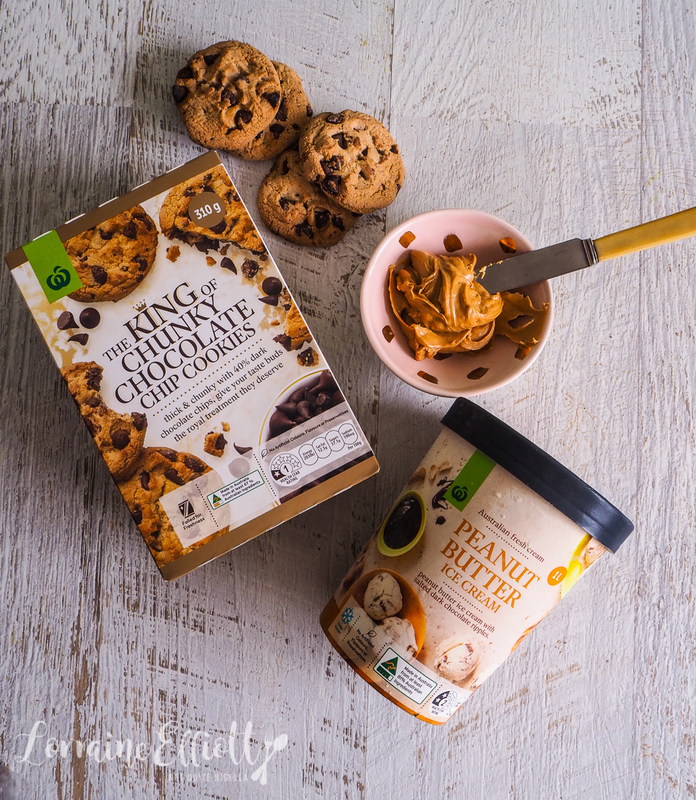 Sometimes biscuits can get soft in the freezer but these King of Chunky Chocolate Chip Cookies stay crisp as you make them fresh every time! Step 1 - Leave ice cream out for 5 minutes to soften a bit. Spread peanut butter on the inside of one cookie. 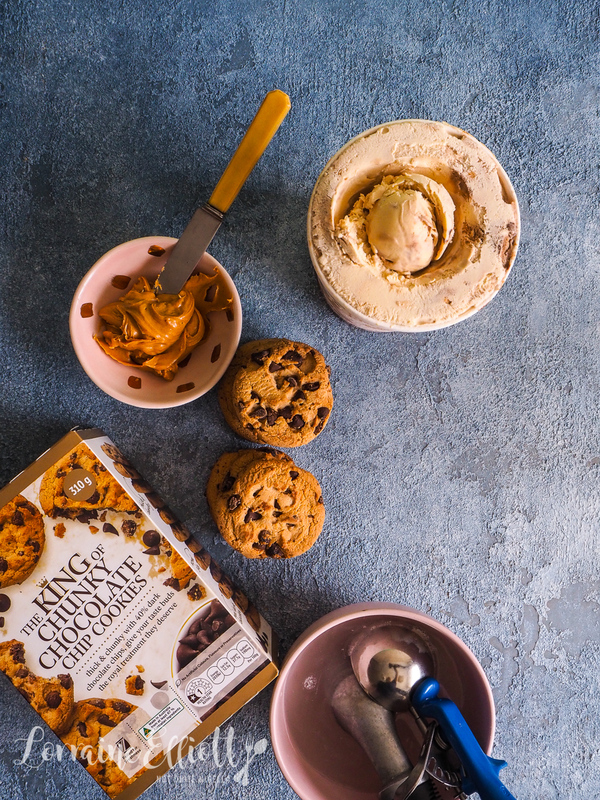 Scoop some ice cream on top and press down with another cookie. Freeze until needed. recipeDate Night With Chicken, Date & Apricot Tagine! 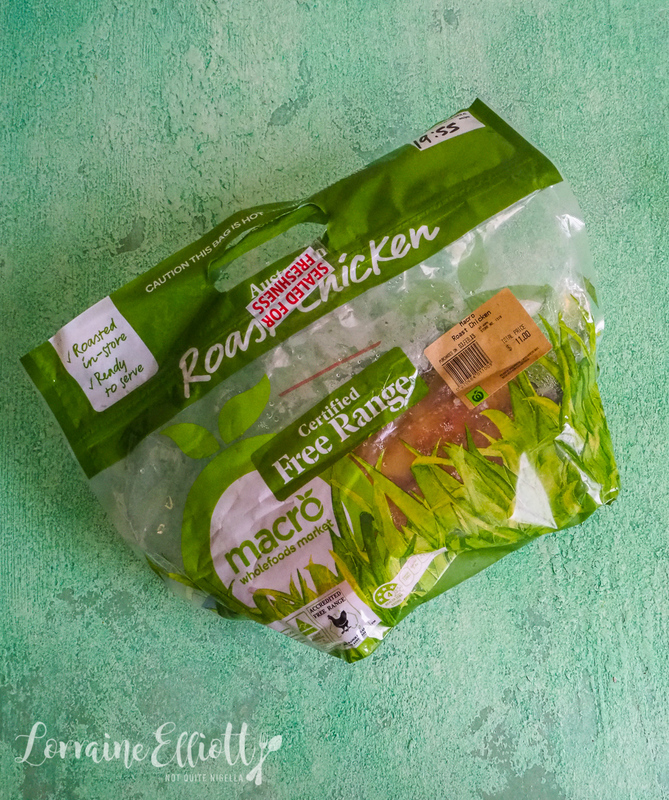 recipeEasy 10 Minute Prep Chicken Mince Kebabs! recipe Date Night With Chicken, Date & Apricot Tagine! recipe Easy 10 Minute Prep Chicken Mince Kebabs!